He would poke his round, tan face out the door and peek at Yaa in the kitchen, which wasn’t a normal kitchen by our standards. 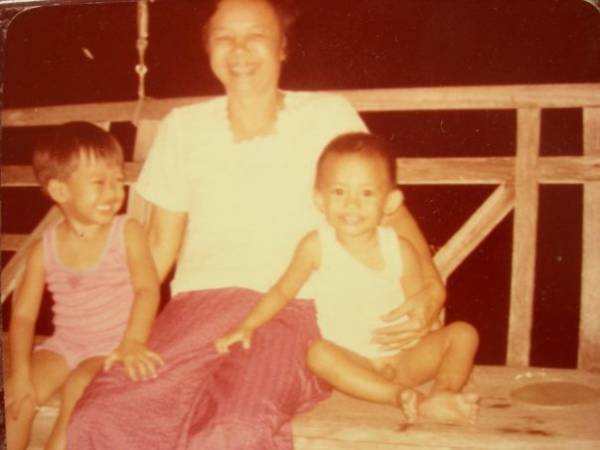 It was outdoor on a cool concrete slab covered with a makeshift plastic roof laid over wooden beams. 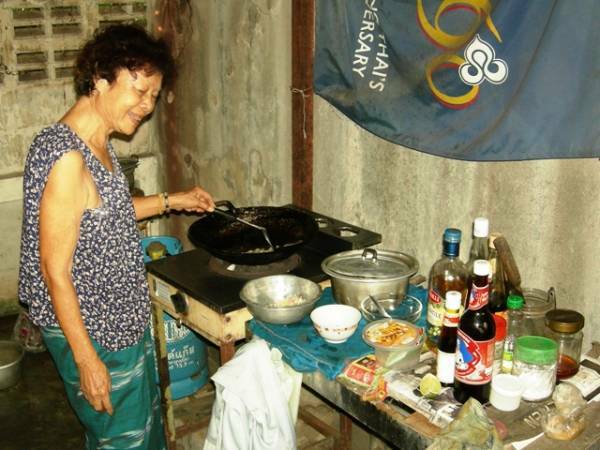 She had a gas burner on the ground with a worn wok where she cooked most meals. All her sauces sat within close reach of her wok, and also nearby sloshed a bucketful of water to wash the dirty utensils. This is Dom’s Yaa in her updated kitchen now in their newer house. Now she doesn’t have to squat to cook. When she was done bok-boking the garlic and chiles, she added some oil to the wok and once it started to dance with delight she threw in the garlic and chiles, coughing some as the powerful scent of the chiles wafted to her nose. Then went the ground pork, fish sauce, black soy sauce, sugar, green long beans, and at the very end, holy basil. 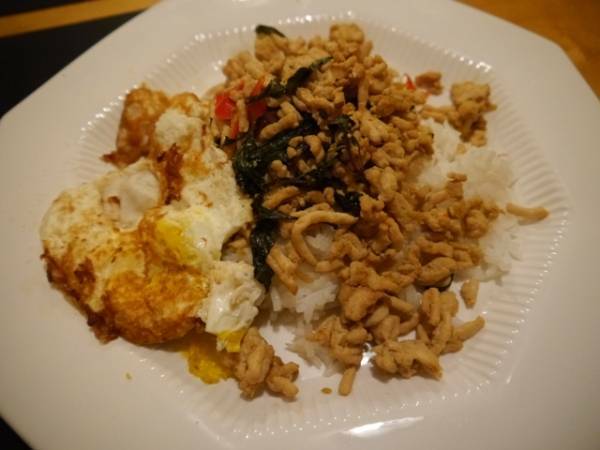 She would put it on a plastic plate, and get Dom to take the steaming Krapaw Moo (Stir-Fried Pork with Holy Basil) into the house while she fried one over-medium egg for each of them. Dom and Yaa would sit on a straw mat on the living room floor and eat their breakfast with a fork and spoon. They wouldn’t talk, since Thais don’t chat too much while eating. Instead, Dom would revel in his breakfast while wiping the sleep from his eyes, and never dream that one day his American wife would make him the same food in their Texas apartment. In Thailand, this is a popular street food and Thais eat it for breakfast, lunch or dinner, but the way Dom grew up eating it with green long beans, is the country-style way of making it. I love krapaw gai and it sort of reminds me of Americans’ infatuation with grilled cheese—the dish that represents a simple childhood pleasure, but as an adult it’s easy to make and satisfies that nostalgic hunger for comfort food. 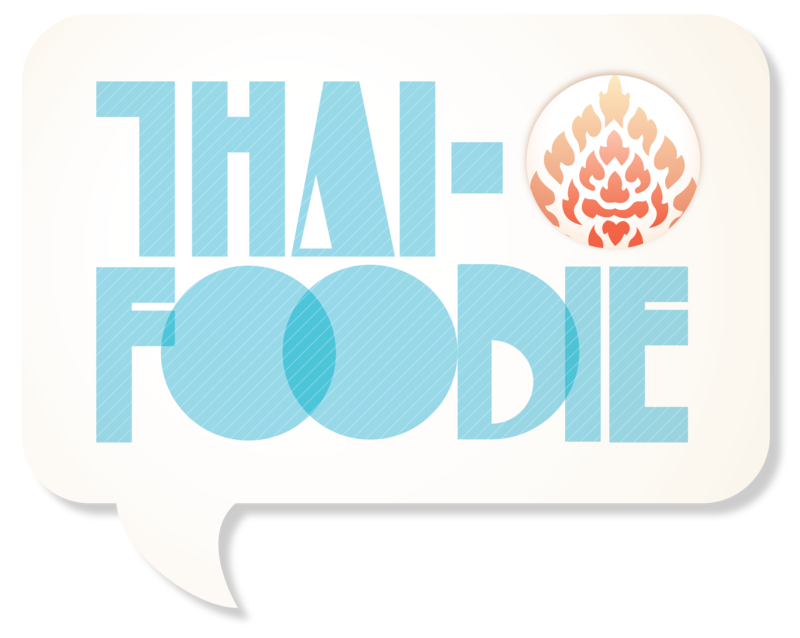 Try some quick Thai comfort food today, and tell me what ya think! This is a quick, simple, spicy, Thai comfort food that always hits the spot. Smash the garlic and chilies in your mortar and pestle. If you don't have one, you can mince them. Pick off the leaves and flowers from the basil. Heat the oil in your wok or pan. Once it's sizzling and dancing, toss in the garlic and chilies and be prepared for the coughing and burning lungs to set in, especially if you like it spicy. Just remind yourself the pain is worth it. Add the meat to the pan and cook until done. Then add sugar and sauces. Add a bit at a time, to make sure you get the flavor you prefer. Add some water if you think it's dry. Toss in the basil until it wilts. Serve with rice. If you really want it Thai-style, after you remove the krapaw gai from the pan, fry one egg for each person and put it on top of their serving. It's heavenly. The black soy sauce is very concentrated and has a strong flavor, so be gentle using it. Yeah dear! And it’s simple to make, and I’m sure they have the ingredients in Aussie! Let me know if you have questions. Wish I could try yours! Looks good! I should try it sometime too! We are blessed in Melbourne to have so many ethnic cultures and so lots of the non-Western ingredients are easy to get in the supermarkets. I’m not sure what you mean by holy basil? Is it what I would call “italian” or “normal” basil? I just made Kra pao and it turned out really well. Was really tasty. Any tips how to make it more saucy? I added a little water but didn’t want to dilute the flavours. Thanks! I’m so glad it turned out well!! I would say add a little more water if you want it more saucey, but then add in more fish sauce, black soy sauce and sugar depending how much extra water you put in, to make sure the flavors are still vibrant. Dom says you can also add in some oyster sauce too!